Extremely rare vintage Satyajit Ray movie poster of one of the finest films ever made in Bengali cinema, Mahanagar (1963) for sale. 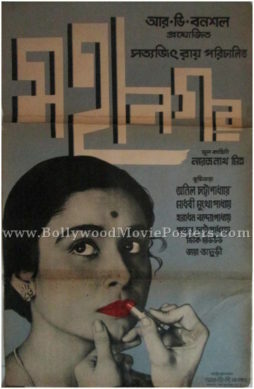 Written and directed by master filmmaker Satyajit Ray, Mahanagar starred Madhabi Mukherjee in the lead role. Based on a short story, Abataranika by Narendranath Mitra, Mahanagar narrates the story of a housewife who breaks traditional norms by getting a job as a saleswoman. It marks the first screen appearance of Jaya Bhaduri Bachchan, who later went on to become one of Bollywood’s leading actresses. Mahanagar was the first film directed by Satyajit Ray to be shot entirely in Calcutta. Besides the hugely successful and critically acclaimed Apu Trilogy series, Mahanagar is unanimously regarded as one of Ray’s finest films, making this rare Satyajit Ray movie poster highly collectible! Satyajit Ray won the Silver Bear for Best Director at the 14th Berlin International Film Festival in 1964 for Mahanagar. The film was also selected as the Indian entry for the Best Foreign Language Film at the 36th Academy Awards. The critical acclaim and success of the film led the Academy Film Archive to preserve Mahangar in 1996.